You'll be £8.99 closer to your next £10.00 credit when you purchase Armoured Warfare in the Battle of the Bulge 1944–1945. What's this? The Battle of the Bulge took the Allied armies by surprise in 1944. It was a result of the extraordinary recovery of Hitler’s panzer divisions following crushing defeats on the Eastern and Western fronts. In a daring offensive he hoped his panzers would unhinge the American and British push on the Rhine by charging through the Schnee Eifel, thereby prolonging the war. The consequence was one of the best-known battles of the entire conflict, and Anthony Tucker-Jones's photographic history is the ideal introduction to it. The story is told through a sequence of revealing contemporary photographs and a concise text. They give a sharp insight into the planning and decision-making, the armoured forces involved, the terrain and the appalling mid-winter conditions, the front-line fighting and the experience of the troops involved. The armoured battle, which was critical to the outcome, is the main focus. Through a massive tank offensive the Germans aimed to cut through the US 1st Army to Antwerp and Brussels, in the process trapping three Allied armies. The confusion and near collapse of the Americans as their defences were overrun is vividly recorded in the photographs, as is their resistance and recovery as the German spearheads were slowed, then stopped. As a general read, or an introduction to the battle, this is an ideal work. War gamers and modellers will find this a useful reference work also. Murdered soldiers looted for their boots, slain civilians in a frozen field and US troops shivering in snow-covered trenches: New book's harrowing images show the bloody reality of the 1944 Battle of the Bulge, which inspired TV's epic Band of Brothers. This book should appeal to the casual history buff, interested family members of veterans, armour enthusiast and modeller alike. It gives a better than average background history and present an excellent array of photos to go with it. Documentation of great interest to the period stalwarts and vehicle modelers. Anthony Tucker-Jones's photographic history if an ideal introduction to the story that is told through revealing contemporary photographs that chart the mud, snow and corpses on both sides. 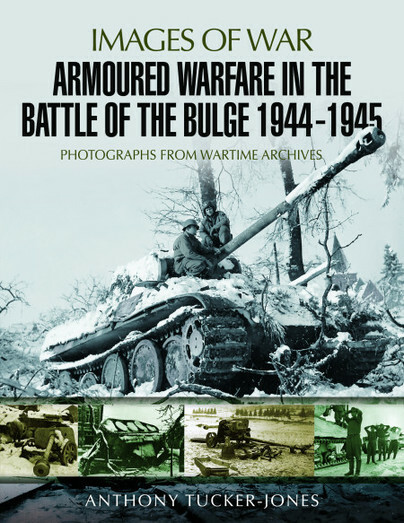 A fine introduction to the Battle of the Bulge, based around a collection of photos. Some of them are well known, though it does include a selection I had not seen before...There were a variety of elements to the story of the Ardennes offensive of 1944 and Anthony has done a nice job of catching them in this new book.